Reduce wasted space and give your bar a uniform look with the Advance Tabco PRFD-2020 Prestige series stainless steel underbar filler! Items found within the Prestige series of underbar equipment line up perfectly with each other, creating a uniform design across any bar. With many great features, like an extended 7" backsplash and a removable perforated drainboard top, this underbar filler is the perfect finishing touch to your bar lineup. 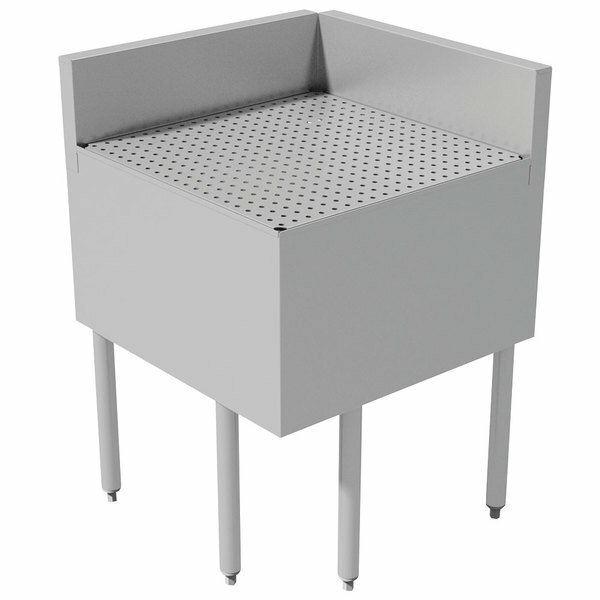 Made with 20 gauge, 300 series stainless steel with an 18 gauge perforated stainless steel drainboard top, this unit is built to last. This drainboard unit bolts securely to your existing bar equipment and fills in a corner with a 90 degree angle. Plus, it includes stainless steel legs with adjustable stainless steel bullet feet for added stability and versatility. Since it comes equipped with a 1" IPS drain, this unit provides the perfect out-of-the-way place to set freshly washed glassware to finish draining while keeping it close at hand.